You know when people say girls should stop trying to look like girls on Magazine covers because even girls on magazine covers DO NOT look like girls on magazine covers -- well this couldn't be more true than what I saw this week on the cover of Real. I have been cheering for Minnie lately after her rather unfortunate year and stint on LIVE. When I read that she would be in a cover of Real, I definitely told myself that I have to buy it but when I saw the pics of the cover online I had to do a double take. Is that really Minnie? 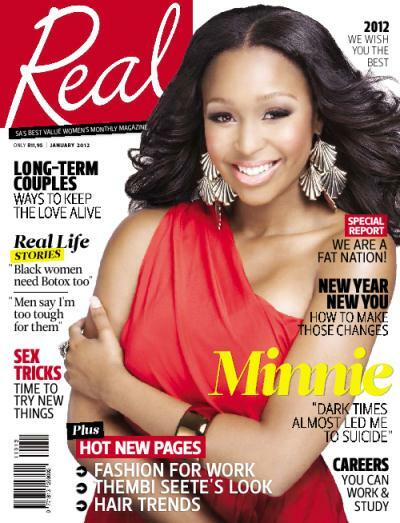 For a magazine that is called REAL I have to say there is nothing real about Minnie on this cover. Her skin looks way too light and a bit too plastic. The left side of her shoulder looks disproportional to the right shoulder. It looks like the right side was added to another picture. Her face looks too narrow, and we all know that Minnie has a "full face". Afterall the girl is not a size 0. These magazines always claim to celebrate women. How on earth would anyone let this picture be on a cover when it clearly screams FAKE from a mile away, beats me. Minnie is proud of her african-ness and her Zulu heritage. Uyintombi yomzulu, why try and turn her into a barbie doll? She looks more like Nicole Scherzinger on this cover than the Durbanite bubbly girl with a husky voice we have come to love (well for some ... hate). Media24 seriously has to start doing something with the professionalism of their Editors. If they are not allowing uncorroborated stories of scorned ex girlfriends/spouses on the covers they are putting dodgy pictures like this. Actually this article has very little to do about Minnie. It is more about the editor and the photographer who let this pic become a front page. For the record, I give my opinion on anybody whether I like them or not. I love Bonang and as you will see with some of the articles I have written about her, I don't always praise her even when she is not deserving of it.